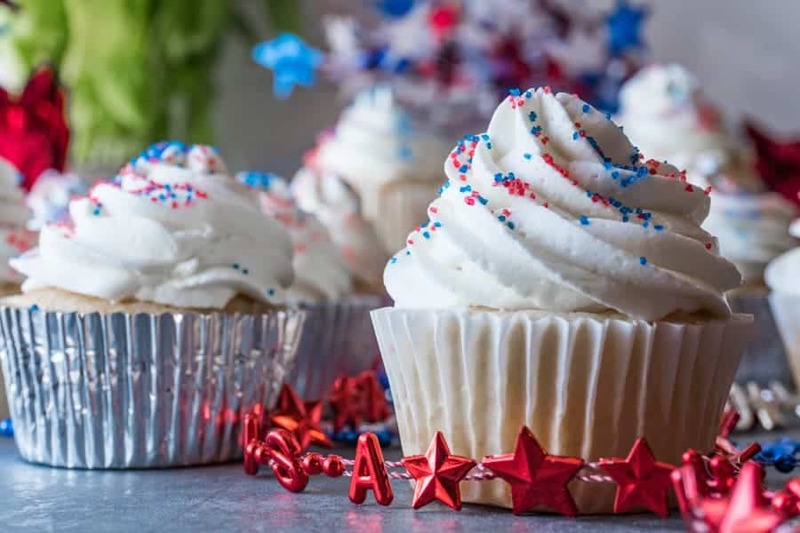 These fun 4th of July Cupcakes are not only delicious but filled with a fun red, white, and blue surprise! 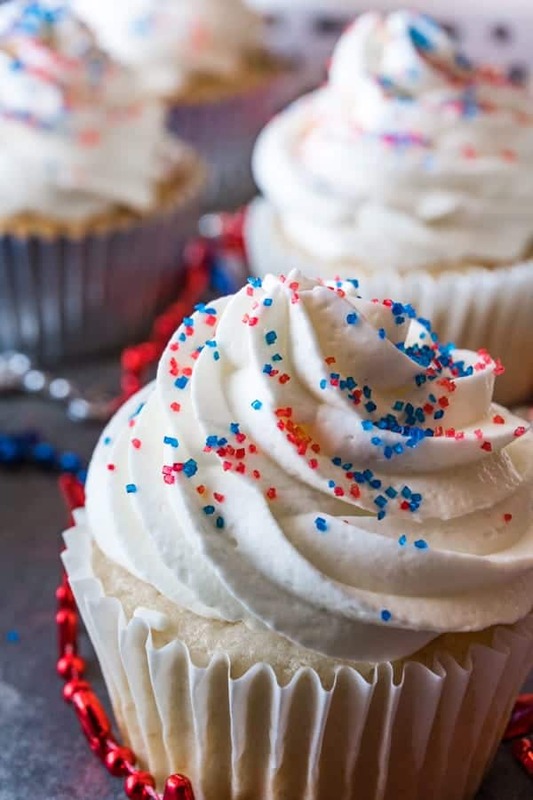 Topped with an amazing whipped cream frosting, these are perfect for your 4th of July parties! Patriotic Cupcakes for the 4th of July are not only delicious but bursting with fun! Combine your boxed cake mix, milk, butter, egg whites, and white chocolate instant pudding. Bake in cupcake liners for 15 minutes at 350F, then set aside to cool. Whip up the easy stabilized whip cream frosting and refrigerate for 20 minutes. Cut out a hole from the top of each cupcake and the stuff full of sprinkles! 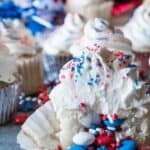 These are one of my favorite 4th of July cupcake ideas! They are super easy to make using the boxed cake mix but taste way better than normal box mixes because of the added ingredients. I always use butter, whole milk, and add a box of instant pudding mix! However, if you like homemade from scratch cupcakes check out my homemade chocolate cupcakes or homemade lemon cupcakes– but if you need a quick and easy white cupcake- these are my go to! For the 4th of July every year growing up I would go to Oregon where, on my great uncles dairy farm, we would have a huge potluck and set off such a big fireworks display that the nearby town would postpone their firework show until the 5th of July! It was so much fun, filled with family, good food, and lots of fireworks! 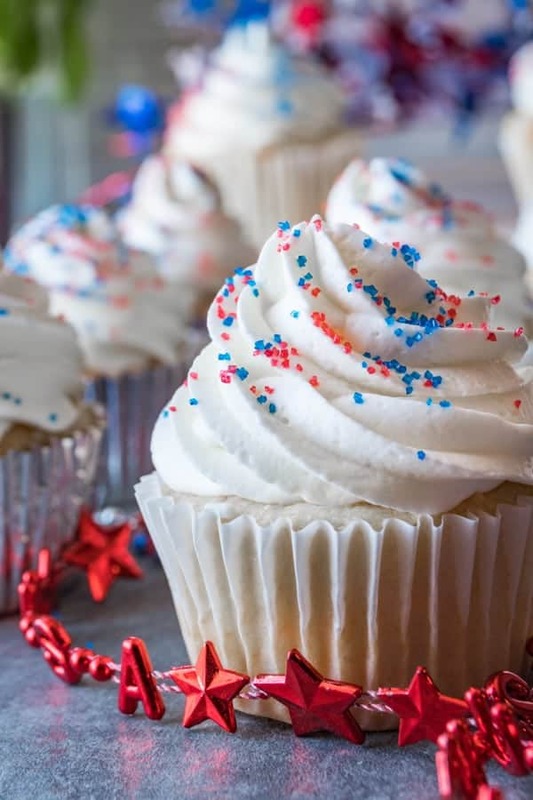 These cupcakes are perfect for any 4th of July party! What are you doing for the 4th of July? Do you have any family traditions? Let me know in the comments below! For other cupcake recipes check out my Hidden Cache Cupcakes (part of my Hearthstone Menu! ), Hi-Hat Chocolate Cupcakes with Marshmallow Frosting, Strawberry Cupcakes with Chocolate Frosting and my Grapefruit Cupcakes! 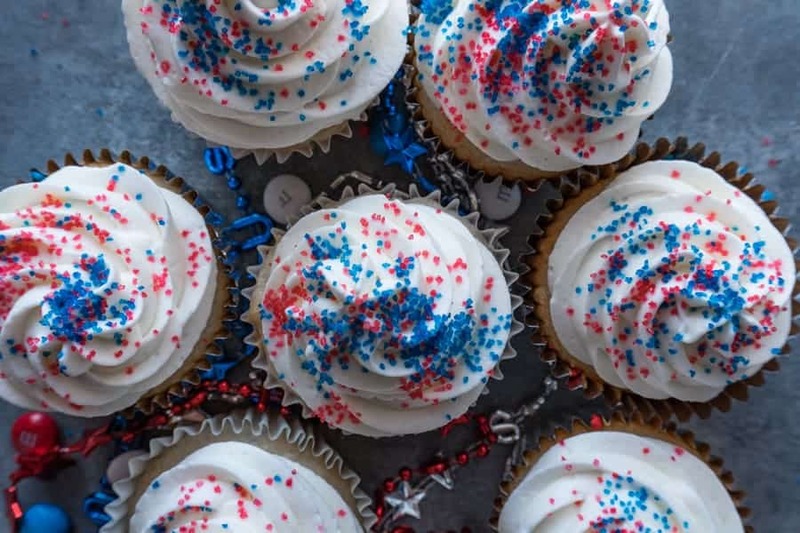 These 4th of July cupcakes are easy, delicious, and filled with sprinkles! 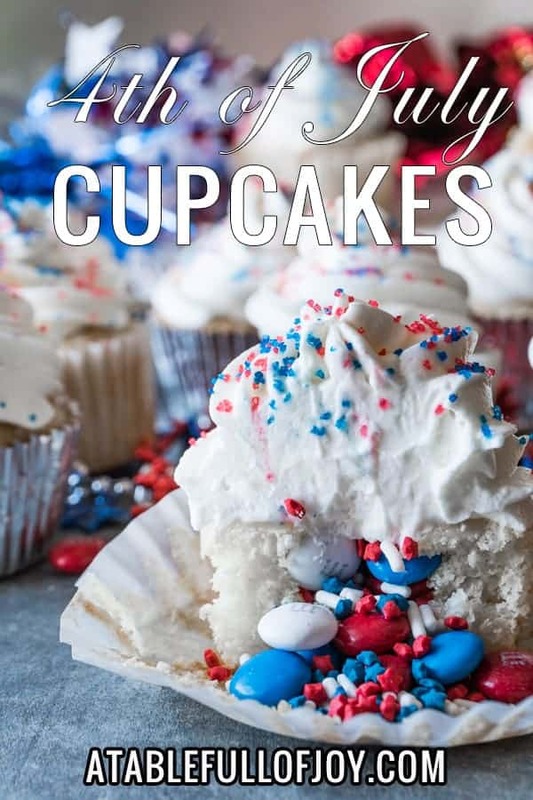 So fun and so delicious for any 4th of July celebration! Preheat the oven to 350F and line your cupcake tray with cupcake liners. Combine boxed cake mix, whole milk, butter, egg whites, and instant pudding. Place ¼ cup of cake batter in each cupcake liner. Make one batch of my easy stabilized whipped cream frosting! Using a spoon, melon baller, or potato peeler (like me! ), cut a circle out of the top of the cupcake and scoop out some of the inside of the cupcake. Stuff the hole with sprinkles- pack them in there! Using your piping tip and bag full of whipped cream frosting pipe on a huge swirl of frosting! I like to start in the middle over the hole, then in a spiral out and eventual up, apply the frosting. Add more sprinkles on top. *For high altitude adjustment (3500ft or above) add a 1/3 cup flour, use only 3 egg whites, and only ¼ cup of butter. Stabilized Whipped Cream Frosting adapted from Tatyana’s Whipped Cream Frosting. Holy moly! These cupcakes are amazing! Such a cute idea. I love the surprise middles! these are so cool! I love surprise cupcakes like these! What a fun surprise to fun inside. I love that there’s a bit of hidden treasure in these. how cute! I would totally make these for any holiday!